Today’s article has nothing to do with golf fitness, and EVERYTHING to do with your golf fitness. Sometimes we all face rough times… and I hope this email gives you the strength to face any obstacles you have in life or your golf fitness goals. I really want you to succeed, but I know you need more than just a solid workout system. You need support from friends, family, and me (and even my chihuahua Carl sends his best wishes). I’m here to deliver the tough love when you are slacking off and missing workouts, or even worse… quitting. Today, I’m going to deliver the tough love, sprinkled with my support. 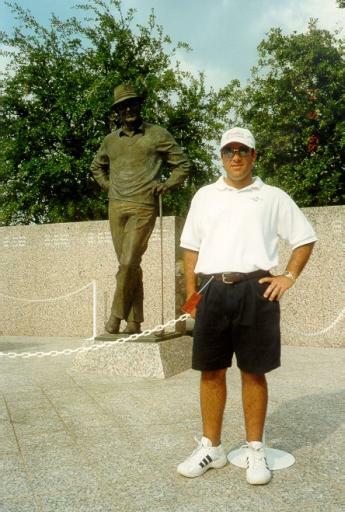 [ ————– Begin Motivational Story ————– ] About 14 years ago, my friend Richard and I went to the Byron Nelson tournament in Dallas, TX. My mom had just passed away from a heart attack about two months previously. Was a rough time for me and my dad. She had not shown any signs of any heart problems. However, she was a smoker and didn’t eat very well. Shortly after, my buddy Richard suggested I head down and watch the tournament in person since it was so close to Oklahoma City. Richard was in Dallas taking his mom on a tour of Texas. His mother flew in from Australia and was a big fan of the TV show “Dallas”. Below are a few pictures of Richard and his mom. Needing to get away, I reserved a hotel room directly across the street from the tournament. This was the best hotel ever, but more about that later. The tournament was great and lifted my spirits. We even staked a spot directly underneath Byron’s personal bungalow and could overhear his conversations with the tour pro’s that would pop in after their round to say hi. I’m still blown away at how many tournaments he won and how great his golf swing was. I remember looking up and seeing Byron sitting up there like a king in his brown leather recliner as the pro’s funneled through to get an audience. Richard’s mom was tasked with getting autographs at the tourney. She wasn’t real interested in the tournament play but wanted to come along. I remember Richard’s failed attempt at getting an autograph from his hero Craig Parry. Craig was walking from the Four Seasons to the putting green. No one was around him, no one even knew he was a tour pro. Richard knew though. Rich went up and asked for an autograph from his boyhood hero. Craig quickly dismissed him and sped up his walk. His mom said, let me take care of the autographs. 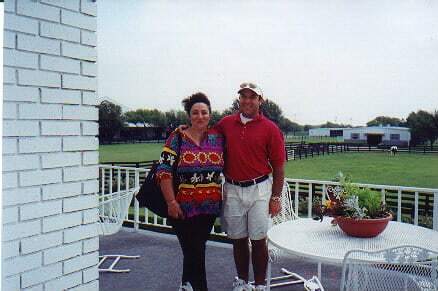 I remember her standing out by the practice green, the range, and just hanging around where the tour players went. Incredibly, her determination paid off and Rich scored quite a few signed golf balls. In fact, he got one from the winner that year, Loren Roberts. A few years later, Rich’s mom was diagnosed with breast cancer. She used this same determination to fight it off and go in to a full remission. It was not easy on her, and Rich had to make several flights back home to stay and help her out… but she recovered nicely thanks to a bulldog determination. So what does this have to do with your workouts, diet struggles, and lowering your score? 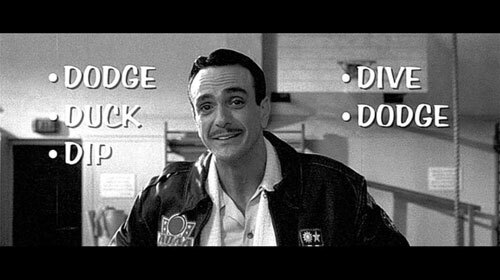 Dodge, Dip, Dive, Duck and uh.. dodge. …and there is a missing D.
Kidding aside, we all experience dark days and dips in our lives. Sacrificing to reach your goals is worth it. Richard’s mom was determined to succeed. She was rewarded with a full remission. Just like YOU are deserving of your Transformation. And just like she did, you’ll remain determined and sacrifice to reach your goals even when you feel like you can’t go on. When you feel down, you will remember to move forward. There will be days when you wake up, roll out of bed, and think, “Another day of the grind.” Yet, you will get out of bed with a positive image of your goals and dreams. You will do your workout, stick to your diet, practice efficiently and then suddenly, one day, it will all come together. Success happens in increments, almost spurts. Sometimes you will feel like things are going in reverse and you get down on yourself. Trust me, success is right around the corner for you. If you are having a rough month, a rough day, or a bad year… STAY STRONG. Thing’s will get better – I promise you. I’ll be here all along the way, no matter how long it takes to get you there. And it may sound old school, but you can learn lessons in the worst of circumstance. Just make sure you pay attention and learn. When you fail, ask why? Did you follow everything to the letter or stray? Correcting course is how we end up winning. Do bad things and bad things happen. Do good things and good things happen. It doesn’t hurt to have faith in your vision either. The right attitude can help you over some pretty rough hurdles. – William James Things could not be better for Richard’s mom today… and we all have obstacles like Richard’s mom… but again, she found determination and maintained a positive vision. Just as it will be for you. And just as it has been for me, too. Every failure I learn a lesson. I sit down with brutal honesty on why I failed and figure out a new path. You see, I’ve been failing my way to success for years. And you can fail – and succeed, too – if you continue to try. Or you can quit, and not taste failure or success at all. I know you will succeed by correcting your course. After all, you play the toughest game of them all. It will all pay off in the end. I know you’re with me. PS – The best hotel ever I mentioned, had free beer night EVERY night of the tournament..
Let me know your thoughts about overcoming obstacles and what goals you have planned for the future in the comments section below. PPS – Back to XTREME training and nutrition tomorrow. The greatest realization I have had was when I realized that whoever said that life is fair and the breaks even out was wrong. The key to happiness is enjoying the little things in life that make you smile and accepting and dealing with the bad things when they happen. This entire article applies to what my husband is going through!! As well as a family!! Thank you for such encouragement!!! Praise God! Christian, Thank you for such a well written, thoughtful and inspiring post. It is incredibly heartfelt and that’s what makes it so inspiring. I congratulate you on your quest…which we share, I am a big fan of Napolean Hill, William James, Earl Nightingale (The Strangest Secret, “You become what you think about most”) and many more inspiring writers.